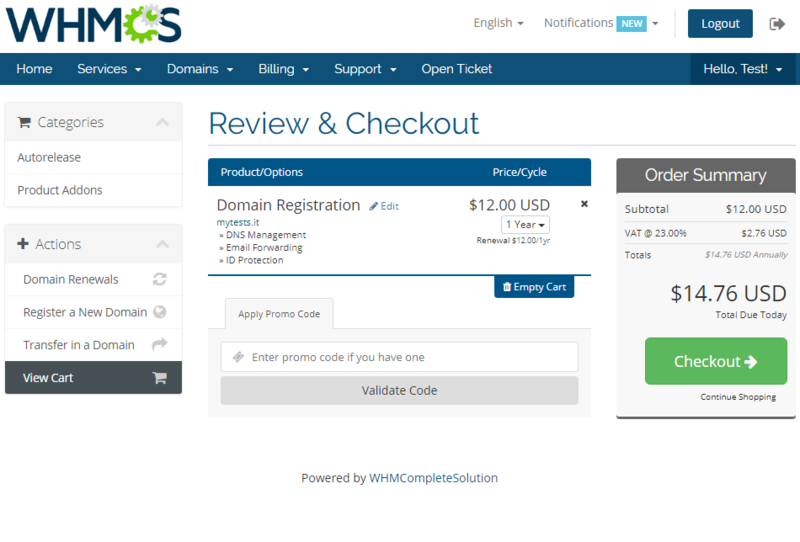 NIC IT Registrar For WHMCS is a domain registrar module that enables automation of .it domains provisioning in your WHMCS. The module has been enriched with mechanism that allows your clients to personalize each domain order and manage domains renewals directly in your client area. 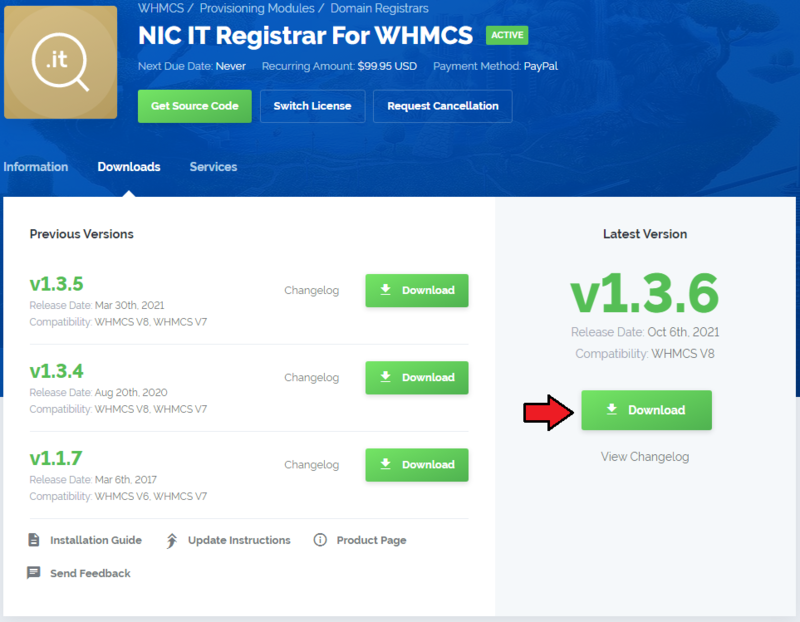 This tutorial will show you how to successfully install and configure NIC IT Registrar For WHMCS. 1. In the beginning make sure that you are the NIC.IT Reseller and your User account is active. 4. 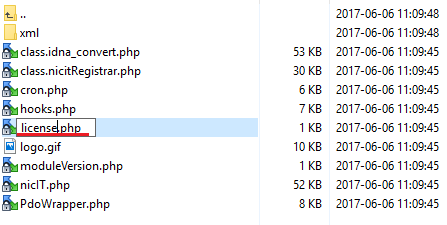 When you install NIC IT Registrar For WHMCS for the first time you have to rename 'license_RENAME.php' file. File is located in 'modules/registrars/nicIT/license_RENAME.php'. Rename it from 'license_RENAME.php' to 'license.php'. 6. Next, please move to yourWHMCS/resources/domains directory and find 'dist.additionalfields.php' file. Important: Introducing any changes into the original file is not recommended by WHMCS. Note 1: Please refer to WHMCS official statement on any modifications performed in 'Additional Domain Fields' file here. Note 2: In case you wish to translate or alter the types names, please refer to the WHMCS documentation here to learn how to do that. Please do not alter the names in the code above! 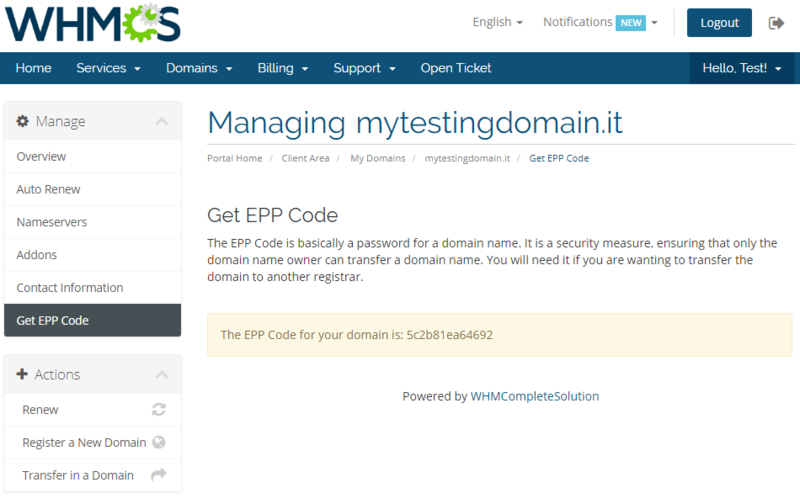 Log in to your WHMCS admin area and go to 'Setup' → 'Products/Servers' → 'Domain Registrars'. Afterwards find 'NIC IT Registrar' and press 'Activate' button. 8. 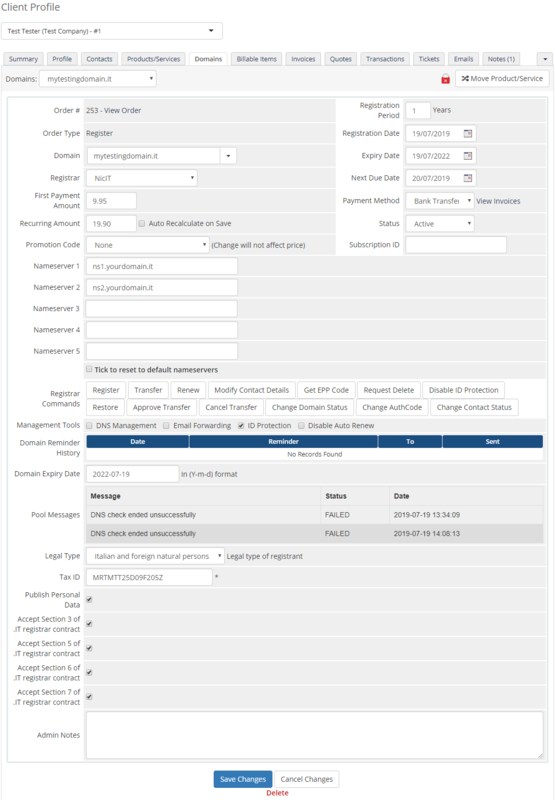 Afterwards fill out registrar configuration with your details. Important: 'Change Registrant' option refers to 'Italian and foreign natural persons' entity type only. 9. At the end you have to add a cron job as shown below (each 24 hours suggested). You have just successfully installed and activated module NIC IT Registrar For WHMCS. 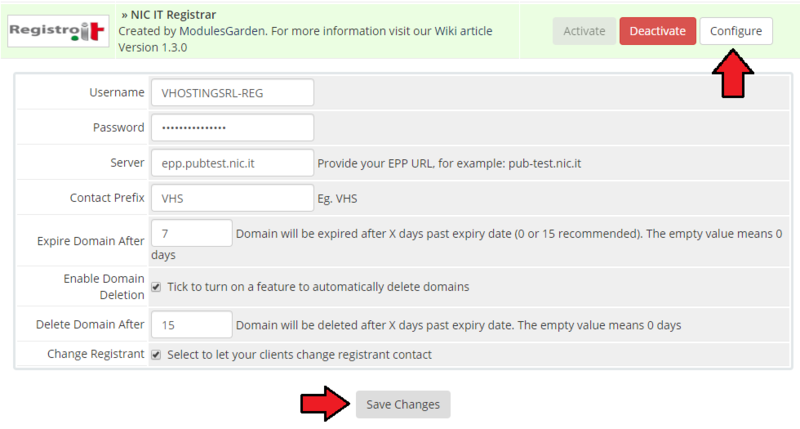 NIC IT Registrar module allows you to manage TLDs in your WHMCS system. Adding new TLD is quite simple. To add it, go to 'Setup' → 'Products/Services' → 'Domain Pricing'. 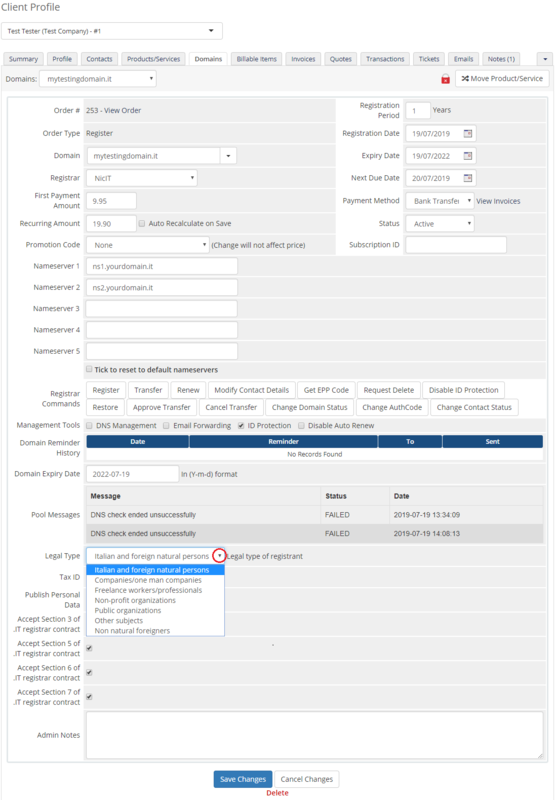 Enter your TLD and choose 'NicIT' from 'Auto Registration' dropdown menu as shown on the screen below. In a newly opened window you can set your prices. Remember to save the changes! Finally set the pricing for enabled domain addons. Now your customers can start ordering new .it domains. 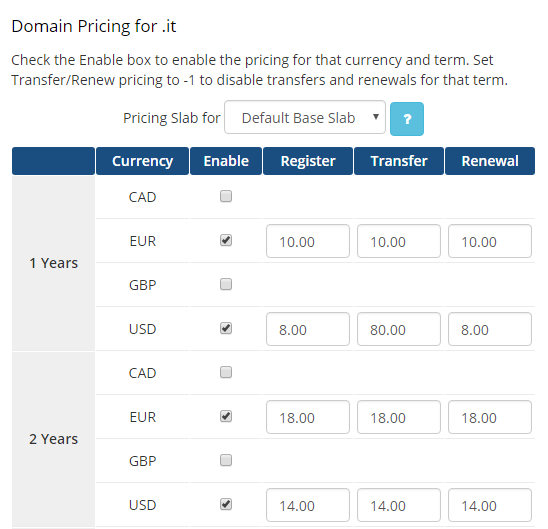 Ordering .it domain goes alike ordering other domains, with one important difference. 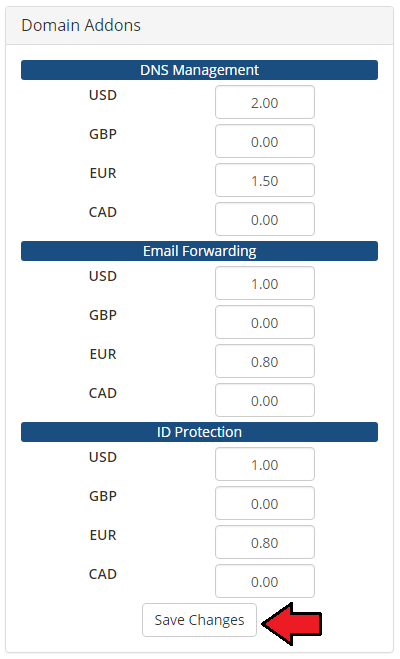 During ordering your customers need to choose 'Legal Type' (Entity Type) and provide 'TAX ID' (VAT number). We will discuss Legal Types in details in the next section. Keep in mind that a default WHMCS option 'Publish Personal Data' overrides addon 'ID Protection'. Therefore if both options are selected, they will exclude one another. In order to avoid misunderstandings you may try to disable 'Publish Personal Data' option. Move to Tips section to learn how it might be done. 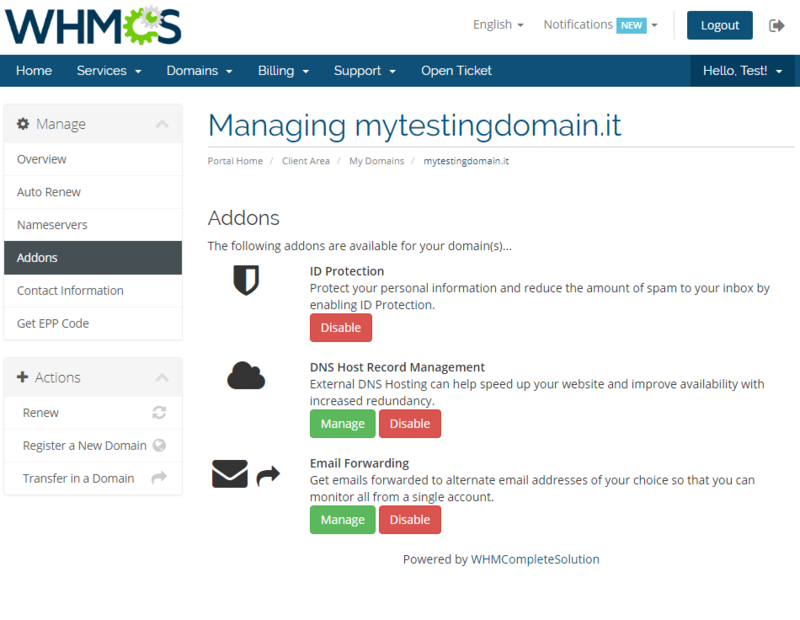 Manage domain, see overview with all the details. Add nameservers, use default or add custom ones. Manage available addons. Disable/enable available ones. 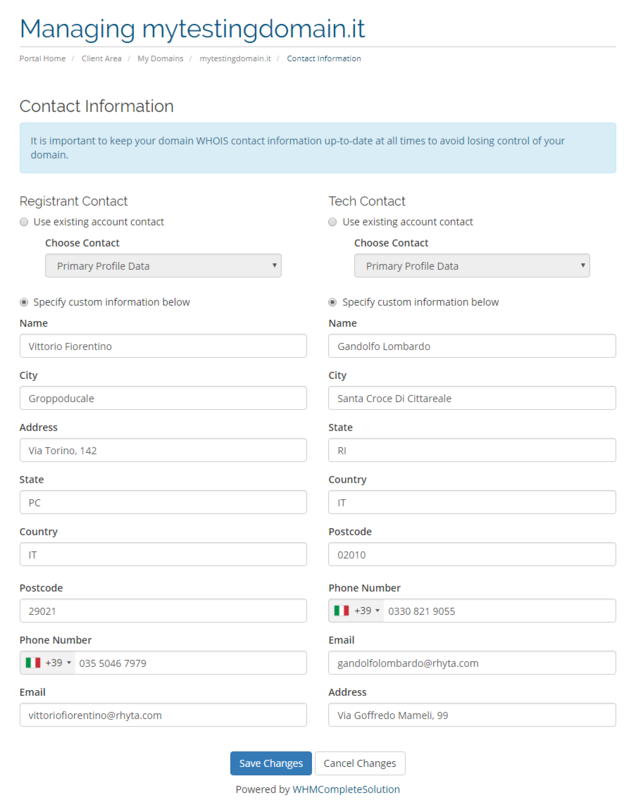 Manage contact information depending on your entity type. Contacts edition is always available and all three types can be edited: registrant, admin and tech. The only exception is when the registered entity type is: 'Italian and foreign natural persons', then only two types: registrant and tech can be edited. In this case also, if in the registrar configuration page in the admin area, the option to 'Change Registrant' is unselected, then registrant edition is completely blocked in the client area. Request sending the EPP code if you wish to transfer the domain. 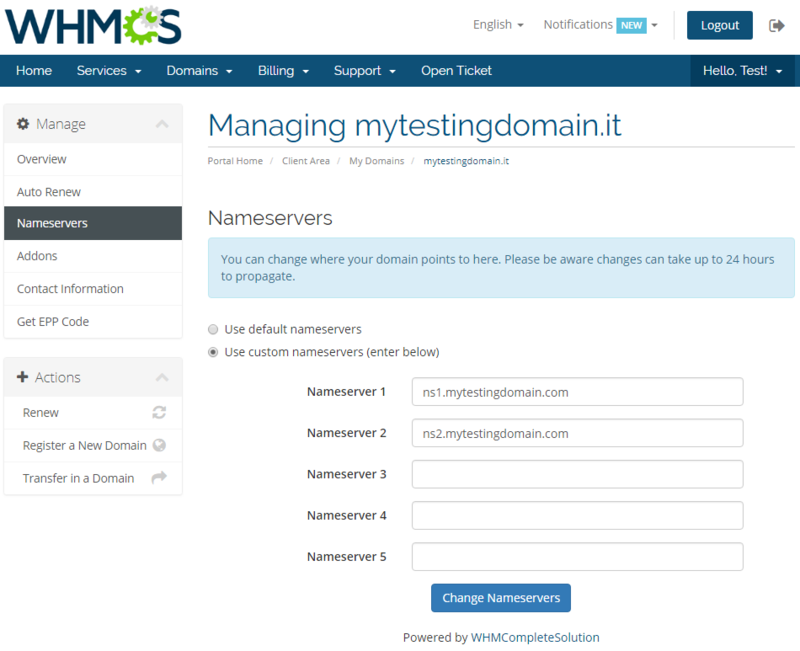 This is how an ordered domain looks like in the WHMCS admin area. 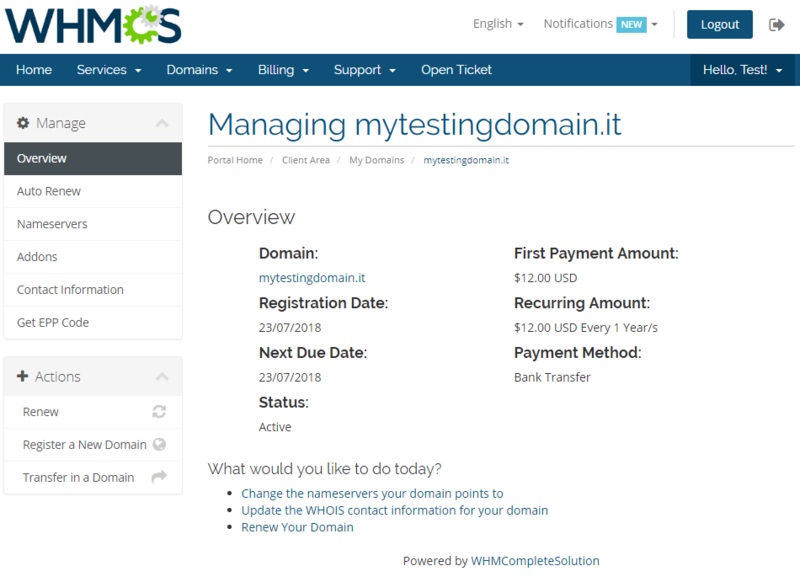 Here you can manage and modify domains according to your needs, like changing contact details or deciding whether to publish or not the personal data of domain owner. Worth mentioning is 'Request Delete' feature which allows you to request domain deletion instantly. 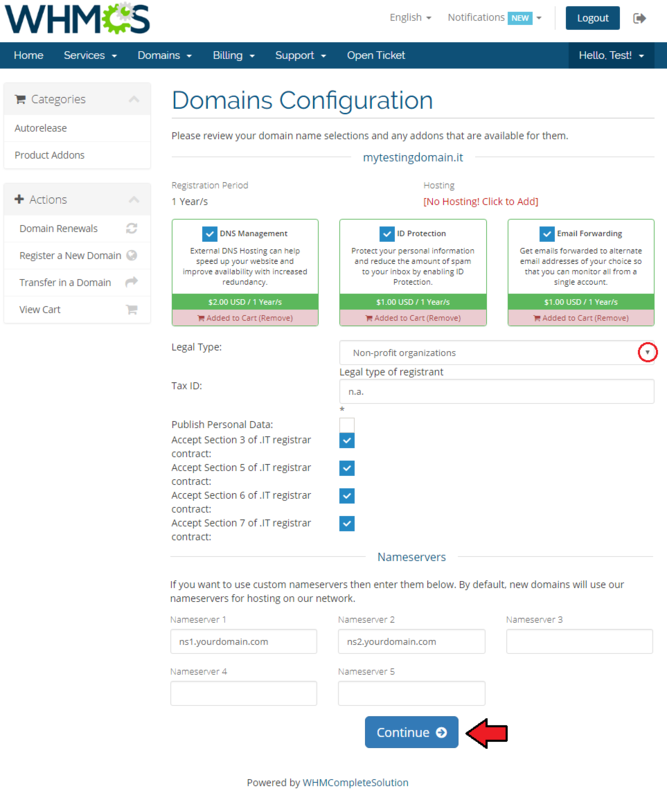 The exact time of when a domain shall be deleted is declared by the admin in the module configuration. Once the provided time passes the domain is automatically removed by cron. Now we will explain you how to correctly set Legal Type (Entity Type) and TAX ID (VAT number). Depending on the chosen 'Legal Type', enter tax number in the 'TAX ID' field. 'Italian and foreign natural persons' customer's address need to be set to Italy and field must contain a document number. 'Non-profit organizations' field value must be set to 'n.a.'. 'Non natural foreigners' enter VAT number in the previously mentioned field. For all other types, simply type a VAT number or a numeric tax code. 1. Deactivation of the module will remove your configuration settings at 'Domain Registrars'. 2. In order to remove the 'Publish Personal Data' option, open resources/domains/dist.additionalfields.php directory. Keep in mind that deleting this line completely is never recommended. Please refer to WHMCS official statement on any modifications performed in 'Additional Domain Fields' file here. 3. 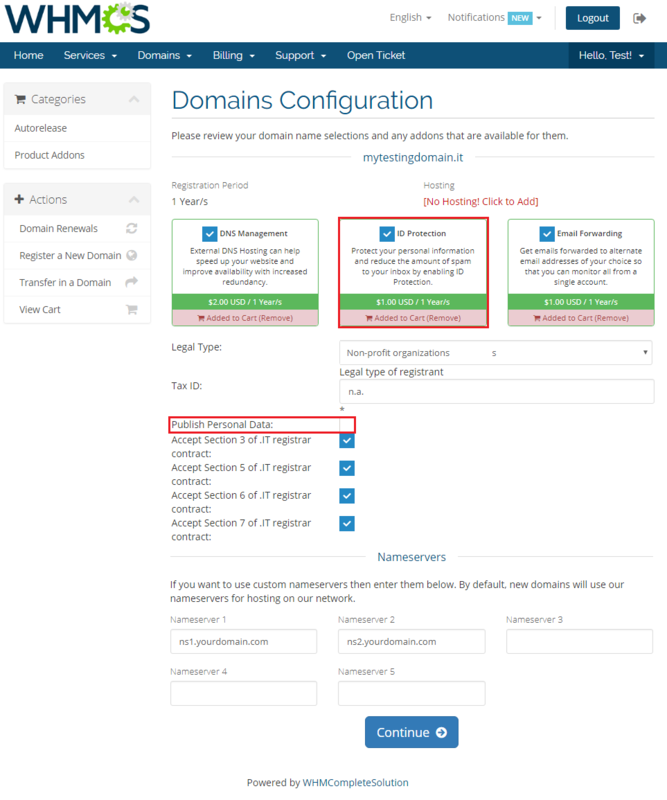 Problem with registering IDN domain may be caused by filling in already converted domain name. The solution is filling in a domain name in UTF8 form, module converts it on its own. 4. If you encounter any problems with connection to NIC IT API, please make sure your server IP address is on the list of allowed addresses. Registrar allows up to 5 IP addresses to be whitelisted. This page was last modified on 22 March 2019, at 13:26. This page has been accessed 65,749 times.